Caption: Steve Farrell (left) and Terry Head. Since the launch of their canned beer range in March, the Eight Arch Brewing Co in Wimborne has seen a 78% increase in their sales. One of their key retail outlets, the Stewarts Garden Centre group, confirms that they have seen the same jump in sales figures compared to the bottled beer they stock in their three centres. Terry Head, retail and marketing director of the Stewarts garden centres, said they stock six of the popular award-winning beers and Eight Arch Brewing Co’s introduction of canned products has made a marked difference to the profile of the product on their shelves. “They taste great either bottled or canned but I think our customers like the convenience of the cans for transportation and the presentation of the cans,” said Terry Head during a tour of the recently expanded brewery with the brewery’s founder and head brewer, Steve Farrell. 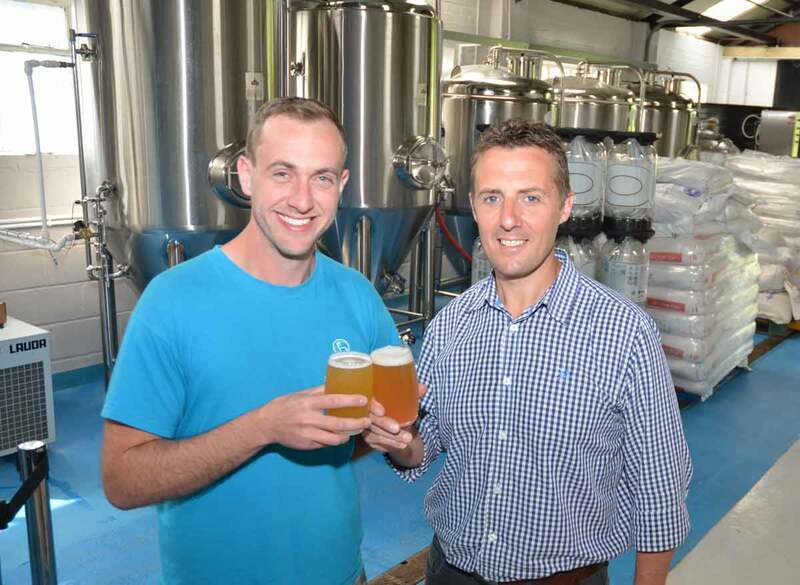 Support from local retailers and other outlets is invaluable for Steve Farrell and his small dedicated team of workers, especially after the expansion of their premises and the addition of more fermenters to increase their production.